When you are blessed with the fire life, you must face and overcome unique challenges. The fire life comes with a mixed bag of gifts and trials alike: brotherhood, sisterhood, crazy schedules, difficulties in communicating, missed holidays, extended days home, worry, love, support, laughter, and many more. Do you wish there was a way to prepare for a successful fire life instead of blindly searching for answers in the middle of some of these issues? 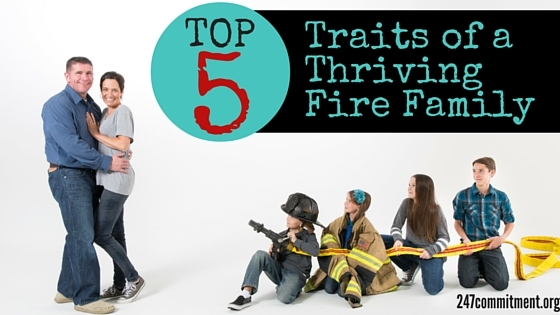 Through the many years of experience of firefighters and fire wives, we have come up with a list of the top 5 traits of fire families who have figured out how to thrive in the fire life in order to support those who are new to the fire life or just looking for some advice along the way. The name of our organization, 24-7 COMMITMENT, exemplifies what we have learned about the importance of commitment and priority. Those who stay committed – to their marriage, their health, the betterment of themselves and the fire service and their family life – have already removed a major mental barrier in life. They believe in their commitment and ability to achieve. The commitment you made to your spouse when you were married didn’t end when the ceremony was over. It is a continual commitment to do your best every day, good or bad, and never stop trying and learning how to strengthen your relationship. The same is true for the fire life. Check in with yourself to be sure you are taking advantage of every moment you have. Prioritize. Have your priorities shifted and need to be readjusted? Are you fully committed, even through the hard times? Firefighters have complicated schedules. Add in the spouse’s work schedule, the school schedule(s), and extracurricular activities, and you suddenly have to become a calendaring guru. You will learn to resolve conflicts well. It may take some practice, but this is a vital part to coordinating everyone’s schedules and still making room for family time, date nights, etc. Firefighters essentially live in two places as part of a family. The have their station family, and their family at home. Complete transparency and honesty will create the trust that is needed between spouses with this arrangement. How do you stay connected between calls and overnights, sometimes many in a row, at the station? Find a way. Technology has come so far, that we are able to choose a communication method that works well for each of us. Facetime and other video calls have been a blessing to many families to stay connected. Texts and good night call routines are other good ways to communicate when you aren’t face to face. If there is an emergency, make sure you have agreed upon a plan of what to do. Who calls who? Where do you go? Who picks up the kids? Most importantly, stay calm through it all. In the fire life we have to deal with a constant flux in schedules. Overtime. Shift changes. More training. Tones in the middle of the night. This is especially true for volunteer fire families who are serving the immediate needs of their community whenever duty calls. And the call of duty isn’t always convenient. Is this easy? Not at first, but don’t worry, you learn to roll with the flow. Changing plans last minute, going stag to back-to-school nights, and planning meals on the fly becomes like second nature, and you may even catch yourself doing it with a smile. Every firefighter has known the feeling of missing a holiday at home with the family. And every family has felt the absence of the firefighter during a holiday celebration. The great thing about the fire life is that we can create our own family traditions surrounding holidays. For example, you many choose to celebrate a holiday when your whole family is together, not on a date just because the calendar says to. Visits to the firehouse are a special family treat. For those who aren’t at super busy stations, you can surprise your firefighter with a visit. Bring the kids, if you have them. Make a dish to share. It is special visit for everyone. Date nights can be hard enough to work out. If you miss a Valentine’s Day, anniversary, or birthday together, try taking advantage of the benefits of the fire schedule. Have a date in the middle of the week. The bonus is, places usually aren’t as crowded then! Something we have that the corporate world doesn’t? Extended days off using only one vacation day. Depending on your fire schedule (24/48, 48/96, etc) one vacation or kelly day off can mean having your firefighter home for 5 days in a row or more! Take full advantage of that benefit and plan a quick trip, family activity, or an overnight date! It’s tempting to just hole up and make your own special fire family routines work for you. But life is better together. And, eventually there will be something thrown at you that can’t be done alone. Having a support group full of others with varying experiences and time in the fire life can be a life saver. Whether it is laughter you need, venting, help finding a solution, emotional support, where to find resources, prayer, or a place to find lifelong friends, we would love for you to find your community of fire families at 247Commitment.org. If you are a new firefighter, recently married a firefighter, or are a veteran of the fire life looking for some guidance on how to be the best you can be in this crazy, wonderful life we love, we would love to offer you a free e-book we have written to help you through some of the common challenges of the fire life. Get my free Fire Family Life 101 ebook!